We decided on Big Pine as a good central location along the 395. It’s close to a lot of great sights, including one that I’ve wanted to see for years – the Ancient Bristlecone Pine Forest. If I do this trip again, I’d probably stay in Bishop. It’s a mid size town that still has a lot of character – and a pretty good brewery. I’d gone to Cedar Breaks a few years ago, and I’d fallen in love with with these amazing trees. They’re one of the worlds oldest living organisms and you can feel their stoic survival just looking at their gnarled limbs. 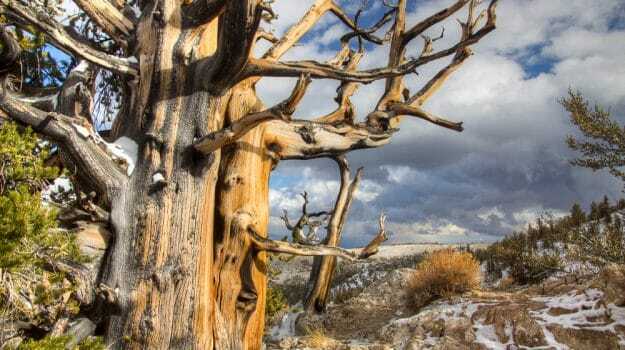 The Ancient Bristlecone Forest in Inyo National Forest contains both Methuselah (long thought to be the worlds oldest) and another tree even older. We arrived there after a few inches of snow had fallen. I think the snow just added to the charm of these fantastic trees. Another day we started out to go hiking near Bishop, but the road was closed due to snow. We decided on the spur of the moment to head up to Mono Lake. Even though Mono Lake has been the cause of a lot of controversy, the views of the tufas (and their reflections in the still water) made for enjoyable shooting. Even after a GPS snafu sent us miles down a very rutted dirt road.